Damn! A great power plant and a very cool frame. Just a shame it was too long and too much rake. With mid controls, a bench seat and more fuel I woulda bought one. 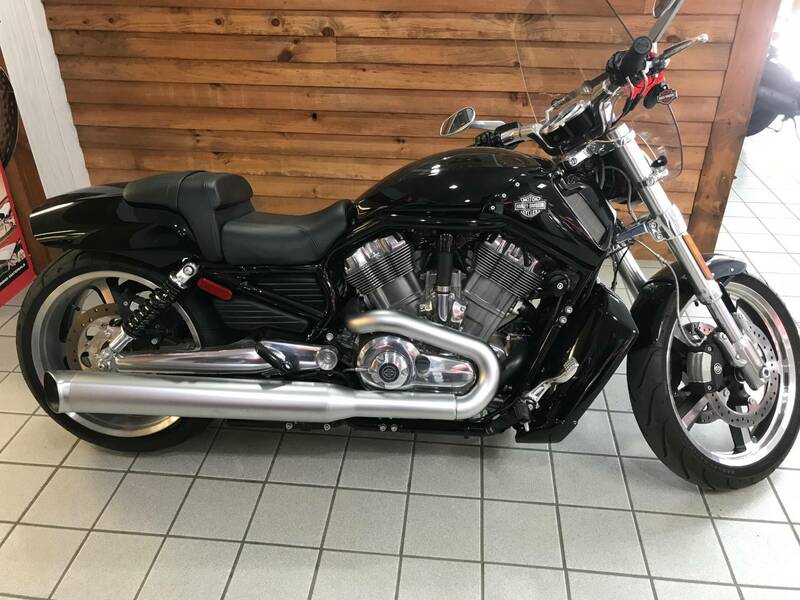 The 2006 v-rod was the only one with mid controls stock on the bike and the engine was always reported as extremely reliable through all the years. Low mileage ones are reasonable priced for a Harley. Some articles have said that it was too bad that they never built a touring bike around that engine. I believe it was called the street rod, a name already reused. The mid controls were great but still too much rake and a horrible seat. A little extra gas resulted in a weird seat latch (Velcro?). At least it had shotgun exhaust. The later two side exhaust was even better. A cool design indeed but marketed to the wrong folk. Harley is going to have to learn some new lessons or they will be history. They are "evolving", but Indian is innovating. They saturated the market. They needed to keep it like it was back in the early 2000's when you got put on a waiting list to buy one. I read that earlier today and really wasn’t surprised. Used prices appear to be dropping. They are already doing the right thing, new motor, new frame, eliminate models, eliminate factories, produce cheaper bike off-shore. The problem is all those low mileage used bikes out there with dropping resale value. No trade-in value! I think the age range of people that were drawn to them are to the point where they're giving up motorcycles as well. They need to attract younger riders to their brand and that's not going to happen with their archaic motorcycles. There are just too many options out there for some people to buy a Harley, you have to WANT one. I watched the VRod documentary again today. It's really interesting. Lotsa cool engineering to do things Harley never did before. But now that the VRod is dead I had a new observation. At every turn the bosses were tweaking or changing the design to make it appeal to the traditional Harley owner. The traditional Harley owner was never gonna buy a VRod and all those design changes made it less appealing to the rest of us. That first prototype with a VR motor shoved in a frame with all the plumbing out there to see was the one I liked the most. All they had to do was not rake out the fork, not step & dish the seat and make it with a 5 gal. fuel tank and I might have bought one! My word, that thing looks nowhere near comfortable to me. Seems like you're trying to touch your toes in that riding position.